The first time I can remember appreciating art was probably at the age of 5 when I visited the Van Gogh Museum in Amsterdam. 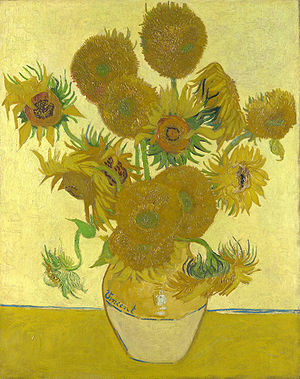 What few people know is that Van Gogh sold just one painting during his lifetime and became incredibly famous only after his death. Sad. But for me, back then Van Gogh's Sunflowers was the most famous painting in the world. After admiring it in the gallery, I got back home and tried to recreate it and what I painted according to me was exactly like Van Gogh's. I was 5 years old then and I believed them. I really thought my art was 'wow' till I went to Art school and was surrounded by people who thought their art was wow too and didn't feel all that special anymore. I did learn a lot though and luckily managed to graduate from college without any of the 4 dreaded art school looks. - The goth makeup look. - The penniless artist with a jhola look. - The I don't look into the mirror before I leave my house look. - The I decided to go bald cause that's what girls in art school do look. Today Art is a lot more than just painting for me. It's anything from a paper fold to a sculpture or a photograph to even a Google Doodle. In India, the word ART is synonymous with one of our most celebrated artists M.F. Husain. He passed away last week on 9 June at the age of 95 and was said to have been painting till about a week before that. Was he special. Yes, to India he sure was. 1. That he loved painting horses. 2. He always had a Bollywood actress as his muse. 3. And he always walked barefoot (even in a city as filthy as Mumbai). I never had the priviledge of meeting him though even if I did I don't know what I would have said to him. He happened to be a good friend of my grandmothers back in the day and he gifted my parents a work of his for their wedding. Generous he sure was. He was said to have done that a lot. Newspapers for the past few days have been filled with articles about him by writers, friends and even just people who appreciate art. What I noticed in most of those articles is that he's been given the title of Picasso of India. Even Wikipedia says so. Why couldn't he just be Husain of India? Why should one artist be compared to another when Art is something that's so subjective and so personal? M.F. Husain was M.F. 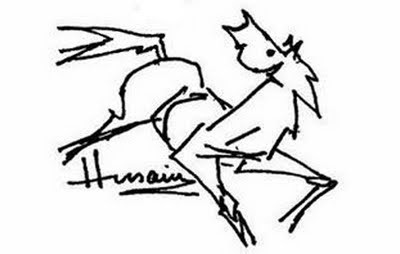 Husain and there will never be another.